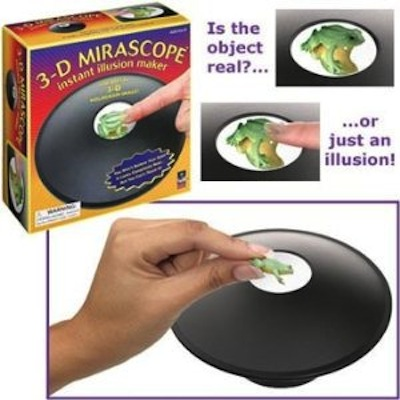 Creates 3-D hologram images to trick your eyes and your family and friends. The images look completely real and solid, but when you try to touch it, your finger appears to go right through it. The 3-D Mirascope consists of two parabolic mirrors that are facing each other - the top mirror has a hole in the center where the hologram effect takes place. Simply set an object in the bottom of the parabolic mirror, and it is suddenly projected as a solid object in the opening of the top mirror. Objects can be easily changed and the same incredible effect will be projected. Includes the mirascope, frog figurine, instructions, and information about holograms. Recommended ages 8 and up.